Stay in dorm accommodation that has hot showers, delicious food, a beach bar and a pool! Visit iconic locations such as Maheno Shipwreck, Lake McKenzie, Eli Creek and more! Fraser Dingo Tag Along Adventure takes you on an amazing experience around Fraser Island, to the highlight destinations and sights. You will have the opportunity to see Central Station, Lake McKenzie and Wanggoolba Creek and more, with the exciting chance to self drive on the world-famous sand island! Beach house accommodation and meals provided along the way. Don't miss out on your adventure of a lifetime at this amazing location in the world - book with us today. Hop in your vehicle and away you go! 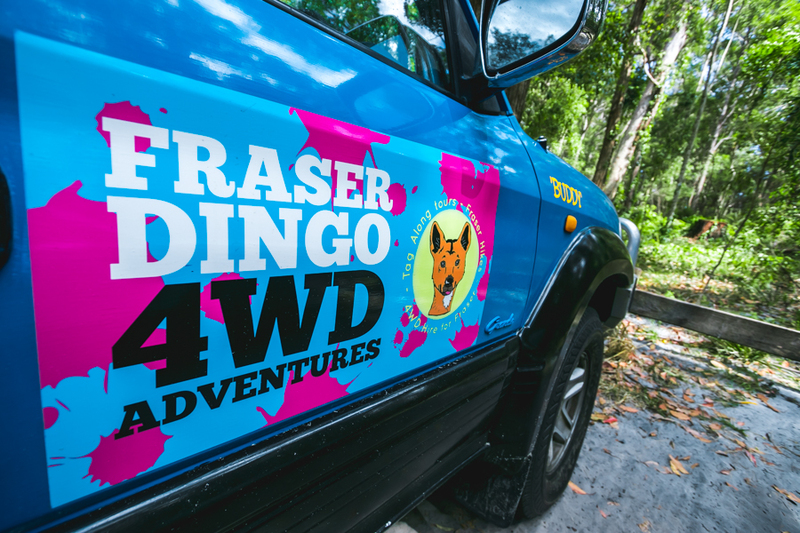 Fraser Dingo's tag along option allows guests to drive on Fraser Island for a completely new and unique driving experience! You, along with 6 other guests, will have a vehicle at your disposal as you explore Fraser Island. Follow the lead car, piloted by your guide, to all of Fraser's best destinations and enjoy the thrill of driving. But don't worry - you don't have to drive. You can also choose to sit back and relax as someone else navigates the sand highway! You will stay at Happy Valley on Fraser Island's Eastern Beach. The private beach house features rooms that host up to 4 people at a time. Each room has an ensuite bathroom and is connected to a communal outdoor deck. Lake McKenzie - One of the best lakes in Australia! Travel to Kingfisher Bay by ferry to begin your 4 wheel-drive adventure and hear some fascinating facts from your guide. The first stop on the trip is Basin Lake where you can marvel at this freshwater dune lake and have a swim! Next stop is Central Station and Wangoollba Creek which is an amazing bushwalk through the tropical rainforest. The group will then head to Pile Valley and Lake McKenzie where you can relax and swim. The day will wrap up as you head to your beach house accommodation where you will enjoy a buffet dinner, and some socialising at the Dingo bar. An early start before you start your journey down the famous Seventy-Five Mile beach, stopping at Eli Creek along the way for a dip or to float down the river! The next stop on the itinerary is the amazing Maheno Shipwreck which has been on the beach for many years as your guide explains. Then get ready to see the Pinnacles Coloured Sands where you can photograph the sand-cliffs! The journey continues to Indian Head which is an amazing view from the headland lookout for spotting rays, sharks and even migrating Humpback Whales (Jul-Nov). After soaking in this view, you will return to your accommodation late that afternoon where you can enjoy the resort before dinner and departure back to Hervey Bay. Please note we are able to cater for special diets such as vegetarian, vegan, gluten free or lactose free. Please let us know upon booking. This menu is subject to change. All client cancellations forfeit 25% of total ticket price and all client cancellations made less than 21 days prior to departure will result in complete forfeiture of the full ticket value. If the tour operator has to cancel the trip (prior to the boat's departure) and we cannot offer a suitable alternative, then a refund will be given minus card fees. We strongly recommend that you have travel insurance, especially during the wet season. Thank you for booking with Mr Travel / Fraser-tours.com . If you would like any advice or assistance in arranging accommodation, transfers or additional tours, please do not hesitate to contact us. "I did the 2days/1 night trip with a friend and we loved it! Scott the guide is a funny, kind and amazing person who take us in wonderful places. And he knows the island very well and he will learn you all there is to know about the island. You are in a group of 20/30 persons who are very friendly, so you will have a good time and maybe new friends! The accommodations are really good (food, where to sleep, cars..)! I strongly recommend this trip and this company! Thank you very much!"